Pools Plus LLC is your one-stop-shop for distinctive backyard environments, including: custom designed swimming pools and spas, patio covers, outdoor kitchens, pergolas, shade arbors and pool cabanas. For years, Sahara Construction has been providing the residents of Katy, TX with top of the line products and service while helping bring their dreams and plans of the perfect home to life. Founded in 2001, Sunset Pools specializes in creating thoughtful outdoor spaces. We are a team of talented designers who are savvy to yesterday’s beauty, today’s styles and tomorrow’s innovations. Fraser First Class LLC is always aiming to set the standard outdoors. From design to project completion, integrity and quality workmanship are our staple to success. We are always aiming to create a product that is set apart from the traditional "cookie cutter" design. With over 15 years in the industry, Fraser First Class LLC is well versed in all outdoor construction applications and is always aiming for client satisfaction along with product longevity. If you are interested in learning more about what we have to offer, you can visit us on social media and our website. Specializing in custom pools and spas, Cody Pools has been ranked #1 Builder in the U.S. by Pool & Spa News four years in a row! Call us today to bring your backyard visions to life. Since 1987, we offer a full range of backyard services including: new pool & spa construction, complete backyard renovations, Hot Spring spas, outdoor kitchens, custom decks, patio covers, landscaping, backyard lighting and now outdoor living furniture! See our full list of services below. We are a certified APSP builder, BBB "Pinnacle" Award Winner for 2008, 2010, 2011, and 2015 BBB Awards For Excellence "Winner of Distinction" award. Stop by our 10,000 sq ft showroom today & see why Richard's Total Backyard Solutions is considered the "Backyard Dream Headquarters" Superstore! We offer two showroom locations: one in the Greater Houston area and one in the Spring/Woodlands area. Call or e-mail us today to "Build Your Backyard Paradise!" Great Escapes Custom Pools is a family owned & operated business serving northwest Houston and the surrounding area. We specialize in complete backyard renovations. U.S. Pool Builder provides professional swimming pool and outdoor living designs, with innovative water features, and landscape elements that suit your desires and personal tastes. 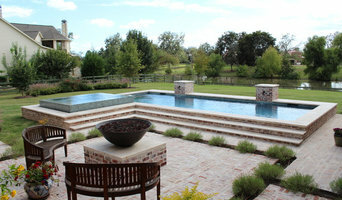 Omega Pools is Greater Houston’s premier established custom pool builder. We specialize in unique and innovative pool and spa construction, and remodels, utilizing the latest in water technology and natural products. All of our designs are carefully thought out to utilize and enhance a home’s unique space. We at Omega Pools are extremely proud and passionate of our work. Our portfolio speaks for itself, but usually we let our clients do the talking, and they have. To date over 95% of our clients came from existing customer referrals. We pride ourselves in the quality we place in our service and products. Omega Pools founders, Bobby Firouz and Gustavo Curiel built Omega Pools to redefine the standards in the pool and spa construction and service industry. This principle makes Omega Pools stand out from its competitors. Whether this is your first investment in building a pool or you are a seasoned veteran in pools, Omega Pools is committed to work with you to deliver exactly what you dream of. Our designers work with state of the art technology to draft 3D models of our pools so you can see what the final product will look like in your backyard. Our knowledgeable and courteous construction supervisors will be with you every step of the way to answer any and all questions and concerns you may have about your project. You will feel comfortable and confident knowing that your project will build to the highest standard, the Omega standard, as we use only hand selected crews that are highly trained and licensed professionals. Anthony & Sylvan Pools is America's Premier Swimming pool builder with nearly 70 years of national experience in the swimming pool industry. DP&L takes pride in creating a superior product. From imagination to fabrication, we specialize in custom gunite swimming pools, landscaping, outdoor structures and design. Decorative Pools & Landscape Inc. can create an outdoor environment that will provide years of satisfaction for your family and friends. We will take your ordinary backyard and transform it into your new back yard paradise and ultimate family staycation truly giving you quality you can dive into! Tactical Pools is here to design and build your ideal pool. Whether it is for fun summer days or simple lounging and relaxation, let us make your dream a reality. Building your dream yard is our specialty. Carnahan custom swimming pools, spas, landscaping, outdoor kitchens, patios, and pergolas will turn your home into an oasis of entertainment and relaxation. We have the right team to do it all at the right price for you. With more than 30 years of experience, we are your experts in custom landscaping and backyard pools. Whether you’re looking for a small, large, luxury, or basic pool and spa, Carnahan can make it happen. We specialize in low-maintenance and durable pools which optimize power and keep year-round costs low. In addition to design and construction, we also clean, repair, service, and maintain existing pools. Our additional features such as irrigation and drain systems, retaining walls, outdoor lighting, and more add the finishing touches to ensure quality, comfort, and safety for the whole family. We guarantee we can execute any design to perfection and help you take full advantage of our beautiful climate in your new yard. We can’t wait to sit down and plan a yard perfect for you, your property, and your budget. We offer excellent rates and flexible financing options, even helping you estimate the value added to your home. With the aid of our showroom samples and 3D Design previews, you’ll have the opportunity to approve the finished product before any construction begins. Once we’ve perfected your personalized design, the building process can start during any season with a team committed to efficiency and professionalism. When you work with Carnahan, you work with friends and neighbors, investing, not only in the value of your home, but also in the Greater Houston community. Contact us today to schedule a free, no obligation quote at your convenience. Our office and showroom is conveniently located in Pinehurst, TX. Visit our office or contact us to talk with a Carnahan representative today! Welcome to Great Escapes Custom Pools! Established in 2003, Great Escapes Custom Pools is a family owned & operated business serving northwest Houston and the surrounding area. We specialize in complete backyard renovations. Our designs reflect our clients’ personality and lifestyle. We understand this can be a significant investment and we take great pride in assuring customer satisfaction. We achieve this with quality craftsmanship at an affordable price. All of our designs are done in full 3D rendering enabling you to visualize the details of your project before you even start. 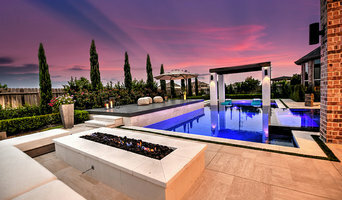 Please visit our photo galleries to view some of the pools and outdoor living spaces we have created. 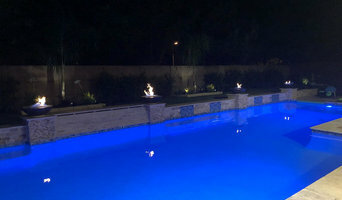 Welcome to Island Life Pools “Experience the Island Life” We started Island Life Pools in 2016 because we wanted to provide the best pool, patio, and outdoor kitchen concepts for our customers. Our goal is to provide a place in your backyard that feels like your own little island. We work hard on every job to deliver a great experience paying attention to the minor details. No job is too small or large. From the owners Tim Weeks and Eric Bishop: Inspired to give people an escape from the long work week we created Island Life Pools. Our goal is to make every customer amazed and feel like there on the own little island everyday. We are native Houstonians and love this city. We would love the opportunity to show you our design work and create a new back yard design for you! Outdoor Kitchens: At Island Life we design the right outdoor kitchen by paying attention to the customer and asking the right questions. An outdoor kitchen provides a wonderful opportunity for family’s and friends to enjoy being outside while cooking and entertaining. Here at Island Life we love being outside so an outdoor kitchen just makes sense! Let us show you some designs and create one for you! Big or small we do it all! Custom Patios: Island Life believes in outdoor living and what better way to enjoy it then with a Patio Cover addition or extension. Bring the living room atmosphere outdoors! Entertain with family and guests comfortably any day of the week! Let us design one for you! Pool Building: Pools done right! Customer satisfaction with attention to detail start to finish. How is this accomplished, because one of the owners is at the job site! We use quality craftsman and products such as Pebble Tec and Pentair. Here at Island Life Pools we enjoy pools and building them we enjoy. See the difference! Call us for free quote! Financing: One of the owners Tim Weeks was a banker by trade and has the banking knowledge to help you thru the process. We have multiple lenders set up offering low interest rates and easy financing for your Island Life project. Call us today and we can discuss your options for financing. Beyond Blue Pools launched its mission of providing exceptional customer service and quality pool care in 2013. We focus on taking excellent care of each and every client. Quite simply, we want to be the last pool service company you ever want or need. Whether you remain in your home with a pool for 1 year or 15 years, we're sure you'll receive such great care and be treated with such honest and respect, you'll never even consider working with another pool company. In addition, each of our employees has been thoroughly screened and background checked. We also consistently drug test. After all, we wouldn’t send anyone to your home if we wouldn’t trust them in our own. Because of our extensive knowledge and experience, we have had articles featured on NBC, ABC, CBS, and FOX for our pool safety, repairs, and business practices. As well as being honored on Angie's List as a Super Service Award winner and featured on Houzz. Tom Hawkins established the woodlands pool company in December of 2006 with "Quality Construction" and customer satisfaction as his philosophy. Prior to starting his business Tom gained 10 years of pool design and construction experience in The Woodlands and Houston area. Now with over 19 years of experience in the in-ground Gunite pool construction industry, Tom has the Know How to design and build it right. If personal service and attention to detail is what you are looking for in a pool builder, then The Woodlands Pool Company is your builder. If you’ve been dreaming of relaxing summer days spent poolside, it may be time to consider hiring a Katy pool builder. A professional can not only help with design and pool installation, but also aid in appropriate maintenance once it’s complete. Whether you're at the beginning stages of planning or want to revamp your existing pool, a pool company in Katy, TX will be able to get you on the right track. What exactly do Katy pool builders do? If you are planning for a new pool in Katy, TX, a swimming pool builder will analyze your outdoor space and your aesthetic wishes to determine an appropriate design for your yard, installing it once the plan is developed and approved. Once installed, some pool companies in Katy, TX can handle the necessary cleanings, water testing, renovations and equipment replacement or repairs for your pool or spa. If not, many can also suggest Katy, TX swimming pool contractors or maintenance services to help with upkeep or repairs down the road. Here are some related professionals and vendors to complement the work of swimming pool builders: Garden & Landscape Supplies, Landscape Architects & Landscape Designers, General Contractors, Landscape Contractors, Solar Energy Contractors. Before hiring a swimming pool construction company to create your new Katy, TX pool, determine how you'll be using it. Will it be for fun or for lap exercise? Will the primary users be children, adults or a mix of the two? Knowing the use can help you find Katy pool builders who shares your aesthetic. Once you find swimming pool builders in Katy, TX who share your style, research is critical. Review customer references and comments, collect at least three to four estimates to compare, meet with potential Katy pool designers and builders in person and ensure that they are Texas certified service professionals and licensed with the registrar of contractors before making any final decisions. In addition, get a sense whether they plan to complete the pool installation and be done with it, or whether they seem interested in building a long-term relationship with you. Be wary of the former: it's likely a reflection on the level of quality of the pool construction they do. Find a Katy pool contractor or designer on Houzz. Narrow your search in the Professionals section of the website to pool builders in Katy, TX. You can also look through Katy, TX photos by style to find a pool or spa you like, then contact the local pool company who designed it.